Are you ‘Loving Your Library’? 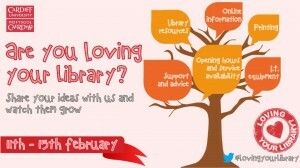 Visit your library between Wednesday 11th and Sunday 15th February and tell us what you love about your library service and how we can improve. In the lead up to Valentine’s Day, the University libraries will be asking you to give us your feedback on using the libraries – what do you love? How could we do better? Visit your library and complete a post-it note to share your ideas. The event will launch our brand new library feedback forms, which you can use to share your comments and suggestions all year round. You can also take part in ‘Loving your Library’ on Twitter, just message your feedback to @cardiffunilib or individual site Twitter accounts using #lovingyourlibrary. To follow up on the event, we’ll be publishing You Said, We Did information so show how your feedback really does make the difference to our libraries.